Dymo 38inchx1inch XTL Pre sized Label Maker Labels DYM1868669 $24.89 XTL Pre sized Labels are durable and made for a variety of surfaces. Whether you are labeling to OSHA, ISO and ANSI color standards or labeling in harsh conditions, these labels have you covered. Jobsite tested, UL recognized labels won't smear or fade. 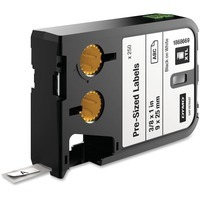 They are ideal for flat surface labeling like bar codes, faceplates, shelves, bins, beams and more. Use with Dymo XTL label makers to help facilitate batch label printing to improve productivity. Black on white labels are made of glossy polyester and coated with industrial grade adhesive. Pre sized design meets a variety of needs including specific labels for small format safety signage.